Decanting wine is sometimes seen as something only the ‘upper-class’ or ‘wine snobs’ tend to do. However, in reality it’s probably more popular than you think and is more commonly apparent as minds are changing and people become more interested and influenced by wine. Decanting wine (especially red) is a great way to fully appreciate the wine you’re drinking, often older wines react the greatest as they’ve been enclosed within a bottle for many years and they finally get the chance to aerate and interact with the air. So what better time to treat the wine enthusiast in your life to a Wine Decanter, whether it’s their first decanter or to replace an existing one! Below we’ve listed our top 5 choices this Christmas. This elegant yet very reasonable priced wine decanter is one of our most popular and sits proudly in our top 5 wine decanters for Christmas. Standing at 260mm in height and holding up to 1500ml, Montana’s Cuvee Decanter is gift boxed and is ideal for someone who’s new to wine drinking and decanting. Machine Made. Why buy? Great value you money. Price from: £24.95 – Click here to view more. The Turn Decanter stands out from the crowd due to its unique and eye-catching design. It can sit on the table within the silver plated zinc alloy base (which is supplied) or it can seemingly lie on its side. With the latter, you can effortlessly push the decanter in a circular motion, this not only looks fantastic but it’s also helping the aeration and decanting process. Why buy? Unique and eye-catching design. Price: £44.95 – Click here to view more. 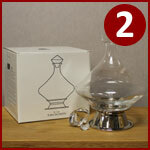 This unique wine decanter ensures that the liquid is exposed to as much air as possible due to the wide surface area. 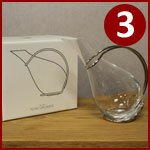 It features a nickel plated handle which is great for pouring, as your hands don’t come into contact with the glass. Therefore this won’t affect the temperature of the wine, which is vital enjoying it to its fullest potential. Why buy? The handle makes it easy to pour. Price: £43.95 – Click here to view more. This wide bowled wine decanter is manufactured by the world renown, Eisch Glas. The ‘Chateau Wine Decanter’ is hand-crafted in Bavaria, Germany and is made from non-leaded crystal. It features a unique opening / rim, the angled cut will aid in pouring the wine into the glass. It features a non-drip special treatment on the glass surface; this prevents any drops from running down the outside of the decanter. Why buy? Hand-crafted and elegant, a touch of class. Price from: £79.50 – Click here to view more. 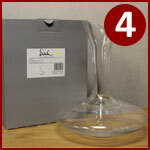 The Eisch Glas ‘Claret Wine Decanter’ is the last to feature in our top 5 Christmas wine decanter. It holds up to 1500ml of wine and stands at 219mm tall, has a nice large bowl so the surface air which the wine is in contact with is of a high percentage. This in affect quickens up and helps the aeration process, meaning your decanted red wines will taste even better once it’s been poured into your glass! Handmade. Why buy? Good value for such a high quality decanter. Price: £61.00 – Click here to view more. 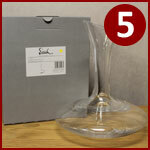 Wineware’s top 5 Christmas Wine Decanter are available to buy online or via the phone. 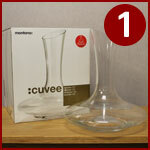 If you wish to view our large collection of other Wineware Christmas gifts, click here! Alternatively, Wineware Gift Voucher are a great idea, why not let your friends & family decide which wine related gifts they’d like for Christmas!